The hip ones would have....and would also have been hip enough to hide the fact, knowing that German mics have long had the cachet of 'approval status' by major labels. If you can get the same result as these esteemed veterans for 10% of the asking price...why, that would mean that "anyone" could do the same (shock and awe). It's still the archer, not the arrows. Though, apparently, only the good archers know this (and they can afford any arrow). Indeed, and if they already own the best arrows, why would they go downmarket with the 'cheapies', unless these have some qualities that the high-end devices don't have ? I would not recommend CM3 for grand piano recording. It lacks bottom end. The OM1 and the No hype audio LRM Ribbon mike are better. With jazz, piano recording is even more "it depends" than with classical piano. You can (need to?) shape the sound way more, sometimes that percussive "mic inside the piano" sound is desirable, sometimes more of a "classical" sound - and which one - warm tail end or sparkling stick side? A little "boxy" with lid reflexion? Maybe one pair isn't enough, maybe it is. Good place to start with a single pair is in the curve, but make sure the lid doesn't mess with the sound you want. Bit too late - already have these ordered - but I might order OM1 for doing solo piano. I thought CM3 will be better to use when more instruments / or vocal are recorded together, due to the omni vs cardioid charcteristics. Is this right? That's certainly not a Steinway D.
I might order OM1 for doing solo piano. Good idea. At 100EU/piece that 's hardly a problem. You mix in the cardios then, or some ribbons. With the OM1 you get that omni-like low freq response. I thought CM3 will be better to use when more instruments / or vocal are recorded together, due to the omni vs cardioid charcteristics. Is this right? whereas the omnis give time of arrival stereo. so mixing both techniques is a good idea. use 1 stereo bar to put the 4 mikes on. I combine the cardios in NOS, and the omnis in AB around it. Other users (Empiria) put the omnis as close as possible to the cardios, so that they can balance between the two. in this way you can tweak the pattern of this mike between omni and cardio. CM3 OM1 and ribbons are also a good choice for spot mikes, if you need any. you can also consider hiring top quality mikes (Schoeps MK2S etc) for main pair, that costs 25-35 euro a pair a day, but in some instances sounds significantly better than OM1/CM3. However ,sometimes there's hardly a difference. A D would be a bit overkill for a room that small. A B would be perfect. Is the one pictured a Boesendorfer? Yup, it's a Bosendorfer, aldo a great piano. But trust me, the Steinway sounds INCREDIBLE in this room, even more from players perpective (I'll be playing it ). Also, it's one of the best Steinways out there - I mean, there are concerts of peple who played hunderds of Steinways, and always comment that this piano is one of the best they ever played. I was considering buying a pair of Oktava MK-012 ... but after hearing and reading so many positive comments about Line Audio CM3 I like more than Oktava MK-012. The model OktavaMod MK-012 is a better buy than Line Audio CM3? The quality control at Line Audio is at a very high standard. That is why there are backlogs at times. The maker will not compromise quality for production volume. OTOH, Oktava has had some complaints about its quality. Oktavamod makes a living out of getting them to work right. I know of no one modifying the CM-3 to "make it better." There is a lesson right there. You may also note that there is no Oktava thread extolling their virtues. There has to be a reason for this. I would not knock Michael Joly. He does good work. He is in some threads here about his mods. If he has been at it for 20+ years and feeding himself that way it is safe to assume he is pretty good. He modified a couple of NT1-A's for me. They are way better now. Just as Michael Joly is good to work with, so is NoHypeAudio. Straight ahead good guys. I have never heard a complaint about them. For the price the Line Audio CM3 is a good buy! I was also considering other various microphones and the NT1-A OktavaMod looks really good as the Hulk 990! I would not knock Michael Joly. He does good work. Don't think anyone's disputing that, or knocking him. The comments were about Octava, not Octavamod. The post directly above mine has references to Oktava (MOD) which I assumed to be a reference to Michael Joly. I meant the comment as a compliment when I made the post and I still do. Longtime lurker here, first time poster. I record almost exclusively fingerpicking guitar and had a pair of CM3's. Eventually ended up selling them to a friend, though now I am kind of regretting it. I liked the tone, I just felt I had to crank my pre amp to high to get a hot enough signal going in. I usually shoot for a peak of -7db or so. Getting that level with the CM3's meant introducing to much preamp noise. I am using a presonus firestudio mobile. Here is a clip if anyone is interested. In comparison my ADK A6's seem much more sensitive, and i dont have to crank the gain on the pre as much. So maybe the CM3's are not the best choice for my relatively quiet guitar playing? Or maybe i need a preamp with more clean gain. It's a pity you sold them before doing a few experiments with input levels. A lot of folks here shoot for peaks of -12 or lower, since recording at 24 bit resolution allows you to boost the gain later in your DAW with no noise increase penalty. So you would have required less preamp gain and consequently less noise. There's no denying the CM3 requires more preamp gain than other mics, but for your purposes this shouldn't have ruled them out. There's a current thread here related to recording levels in another GS forum which suggests -12 to -18 dBFS is the way to go: How loud should I record? Use compressors or no? Thanks for that info, I will check out the thread. The CM3 should work fine and won't be a source of noise unless you place it really far from a quiet source (whcich is not the case here from your audio sample) and compress the heck out of it. Now, if preamp noise is a problem for you or if you plain prefer to avoid using too much gain from your pre, Triton Audio makes the Fethead Phantom which is a short XLR size 18 dB booster for condenser mic. Totally quiet and clean. Could be a solution to your problem. The level of the self-noise from the CM3 at the input of the preamp is (16 - 94) dB re. 1 Pa A-weighted - 44 dB re. 1 V/Pa = -122 dB re. 1 V A-weighted = -120 dBu A-weighted. This is much above the equivalent input noise level of any preamp, on the order of -131 dBu A-weighted for the quietest ones while a preamp with -125 dBu A-weighted EIN shall be considered as very noisy. Hence the preamp noise should not be an issue when using the CM3. Assuming preamps with clean amplification. I've tested multi stage preamps in various analog consoles that would not fit this description. Obviously, a totally clean pre throughout its gain travel should not "add noise" and then the input noise is indeed relevant. I wish manufacturers would agree on a way to measure and show this in a more... straightforward manner. Thanks Didier for the math! 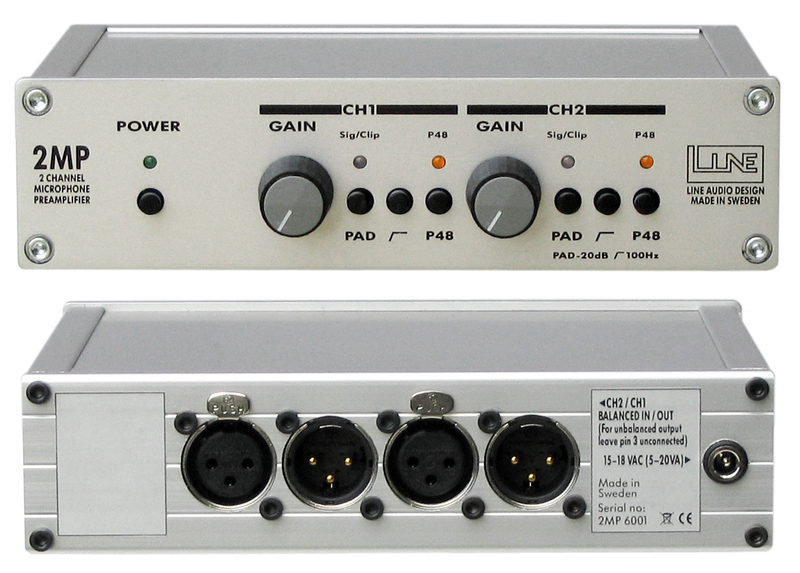 This mic preamp would fit the bill very nicely too ! For increasing gain in Logic, you can either add the Gain plugin as an insert on the track in question (more flexible and easy to tweak), or open the track with the Sample Editor and apply the "Change Gain..." function (useful if you want to run it through noise reduction software or whatever). Either way, you can choose an amount of gain that keeps the overall level in the zone you want, without slamming the track fader (i.e., gain staging). And, yeah, if you're recording in a noisy environment, you have an uphill battle. The issue with the CM-3 is probably less the sensitivity than the fact that it's a wide cardioid, so it will tend to pick up more room sound than a "regular" cardioid like your A6.